Home » Eat Well » Partied Hard This Diwali? 5 Detox Drinks To Get Back On Track! Partied Hard This Diwali? 5 Detox Drinks To Get Back On Track! Detoxifying your body every now and then is a good way to help cleanse your system and to get rid of toxins. Having detox drinks is a good idea after a festive season or once you are back from a vacation. Since you may have indulged a bit too much over that time, detox drinks help your body get back in shape. Detox drinks also help your body shed the excess fat. Watermelon is a great detoxifying agent, it contains an amino acid called citrulline which helps rid the body of the toxin ammonia. 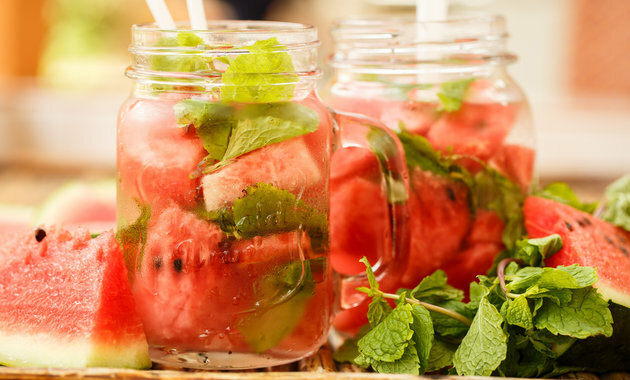 Flavoring water, which also helps flush out the body’s toxins and makes the liver and kidneys job a little bit easier, with watermelon and mint is a great way to detox. Mint adds a great flavor to your drink and it helps with digestion by enabling the flow of bile to the gallbladder and small intestine, which breaks down fats. You can also add a squeeze of lime for a bit of zing. Leave the mix overnight and drink the detox nectar with cubes of ice the next day. Cucumber also has citrulline but less than that of watermelon. Add to this lime juice and wedges of lime, which are important for bowel regulation and treating heartburn and gas. Mint is another key ingredient to this water mixture for added flavor and digestive relief. The best detox drink for when you wake up first thing is either warm or cool water with lemon and ginger. Just grate some ginger into a cup of water and squeeze in some lemon. Lemon is a natural detoxifying agent and ginger helps boost your metabolism. You can see why drinking this first thing in the AM makes the most sense, it kick starts your system and gets your body ready for the day. This smoothie is rich with essentials oils and detoxifying goodness. Blend avocado cucumber, fresh basil, a pinch of salt together for a great boost to your digestive system, metabolism and kidneys. If you feel like it, throw in a few nuts particularly almonds, which are great for your liver, for added flavor. Rest assured this green drink may not look appetizing but its full of healthy benefits for your body. We all know that a fat build up in your body lowers your metabolism and adversely affects your cholesterol levels. White tea is a great detoxifying agent because it serves two key functions it helps the body break down fat and prevents the body from forming new fat cells. So, go ahead and give these drinks a try and help your body cleanse naturally. Stay Healthy, Stay Happy! Avoid These Foods To Keep Your Teeth Healthy! 5 Health Benefits Of Lentils You Were Unaware Of!